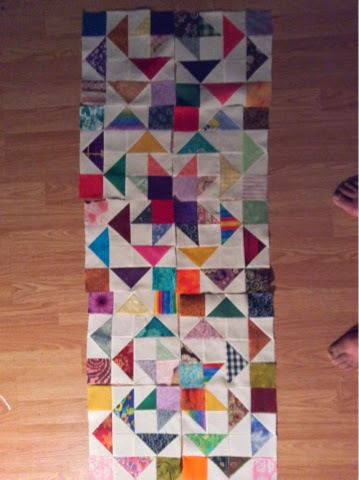 I have been working lately on making scrap quilts. It's an effort to try to tame the ever growing scraps of fabric I have. Some are my scraps and others were gifted to me. 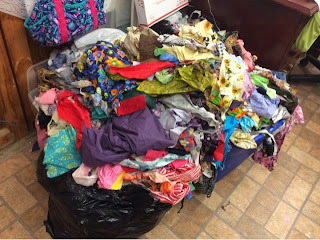 I have made five to six full to queen size tops out of this pile but instead of the pile decreasing it seems to be multiplying. Below is my next scrap top from the scrap pile. The pattern appeared in the May/June '14 issue of Quiltmaker. Pattern name is Jelly Beans by Melissa Carry. I have 10 blocks of the 100 needed. This is my first scrap quilt where I use a solid white background and I love it. I see many more to come with white as the background fabric. It really makes the colors POP.